October in the rain shadow is a transition month from summer to winter, and really is our only fall month; September leans heavily toward summer, and November definitely is winter, as is evidenced by the weather today, November 11th. 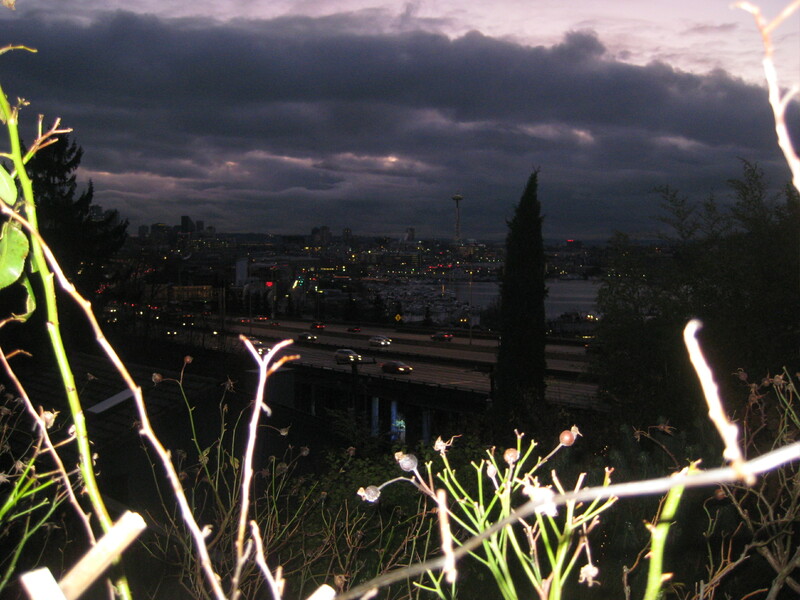 In contrast, Seattle had only 3 blue-bird sunny days, and recorded 18 cloudy days. I had the good fortune of spending the last third of the month based in the rain shadow, and was surprised that even on the “cloudy” days, there were often clear sunrises and starry evenings. The rain we did have fell heavily and departed quickly, really not interfering with outdoor activities like bicycling and boating at all. On one of the cloudy days, the rain shadow had simply shifted a little out into the Strait, and we were able to chase it down in the boat; on that trip we ran into this fella, who also seemed to be enjoying the shadow. 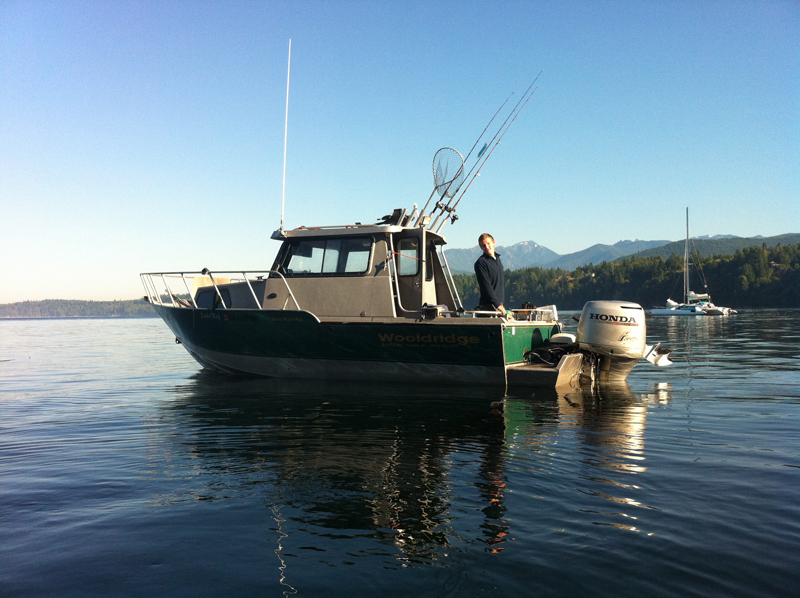 Summer recreational boating in the Juan De Fuca Strait is rewarding but can be quite rough at times, depending on a number of factors including location, wind, and currents. 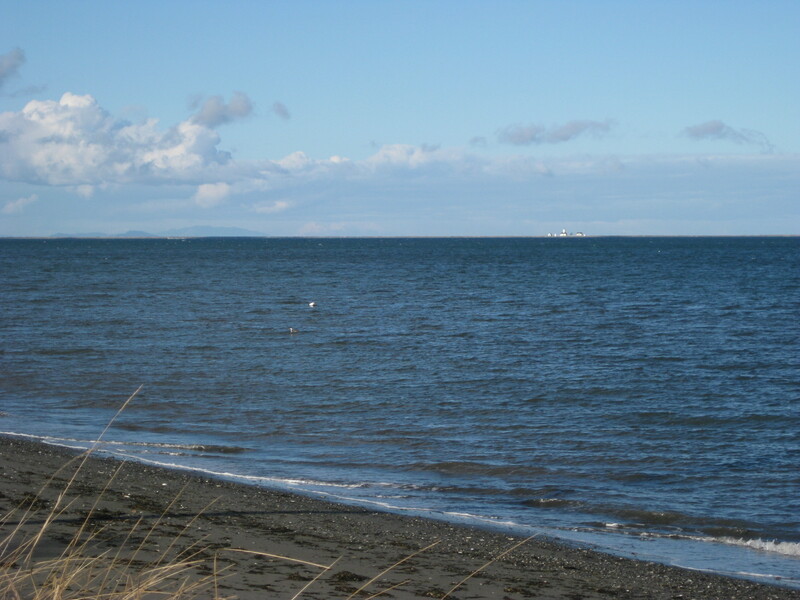 The Strait’s summer conditions are heavily influenced by the narrow opening between the Olympic Mountains and Vancouver Island, the same topography responsible for the rain shadow in the winter. The features create very large tidal flows and thermally induced summer winds that frequently run to 30 Mph. Furthermore the bottom topography includes major shoal areas which further amplify wind and tidal effects. The primary concern is short rough seas in the 3-6 foot range with steep waves that seem to come from all directions. 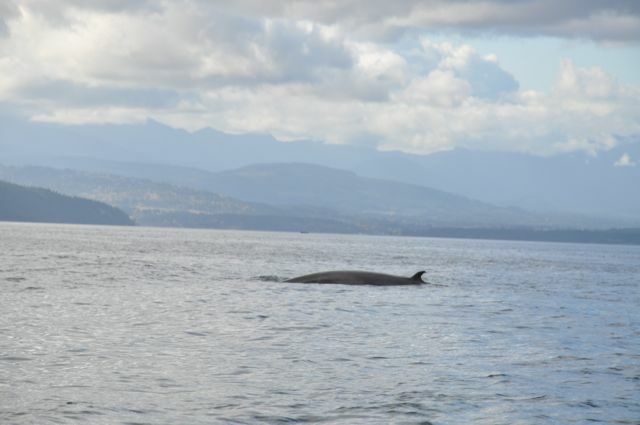 In this blog post I’ll share some of my experiences and draw some conclusions about crossing the Strait of Juan De Fuca. In general my crew of family, friends, and myself have found the Eastern and Central strait to be tricky water. These areas seem to have routinely the highest winds and roughest water in the summer. Hein Bank, which is approximately ½ way between Sequim and the San Juan Islands, some 12 miles from land in any direction, is a shoal area that rises from waters hundreds of feet deep to water to only about 30 feet deep. Luckily, the coast guard operates a buoy on Hein Bank which reports via the Internet, real time and historical wind, current, and wave data. This buoy data is invaluable for excursions in the central and eastern strait. Before any attempt at crossing the Strait, boaters should consult this buoy for current and trailing 24 hour wind and wave data. Here is a summary of my experience overall. All departures were early morning and/or timed with light winds. My definition of a “bad trip”, no pun intended, is not a disastrous, nightmare, rather it is one through short high seas where I need to slow to 10 mph or less and adjust my route to “tack” into the seas and/or run with them; the boat bangs around, and you worry what would happen if you needed run on your trolling motor. 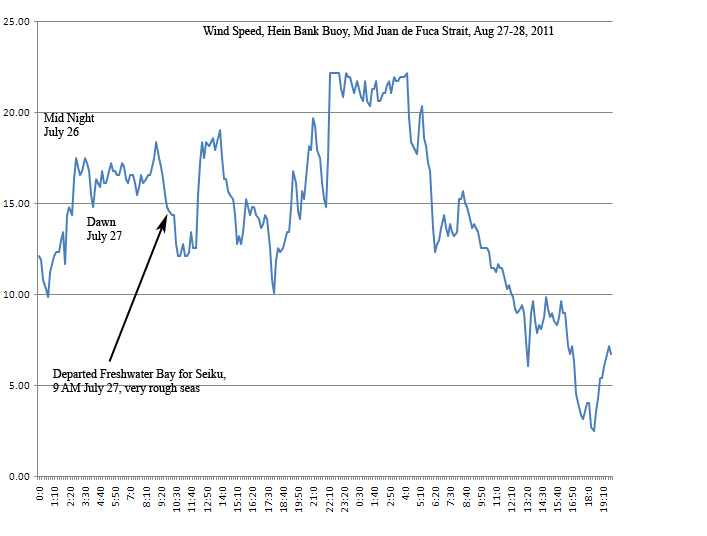 On two trips during the summer of 2011, I took an extensive look at tidal and wind conditions to determine what made the difference between a pleasant trip and a bad one. I’ll look at these two trips in some detail, and then draw some general conclusions, based on those and other trips. Here is map of the area of that summer’s trips, with the two routes shown I’ll look at. Departed Sequim for Orcas Island, 1:00 PM, August 1st; returned Orcas 5:30 AM August 4th for Sequim. Route, Dungeness Spit, Hein Bank, Cattle Pass, Orcas. approx 46 miles. The above charts show two things clearly, there was a lot of tide flooding and there was a significant wind drops overnight before my trips, especially on August 1st. 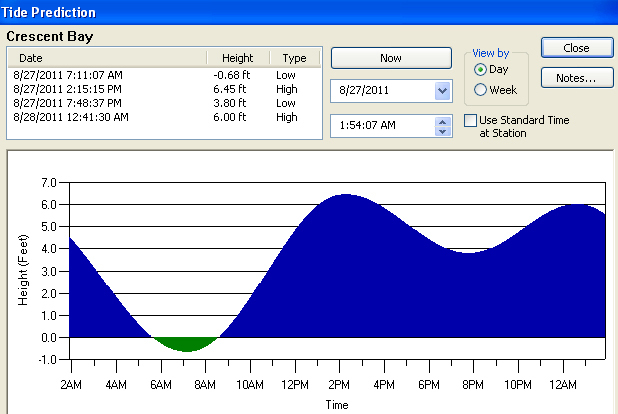 In terms of boating conditions, the trip over on Aug 1 was flat water. 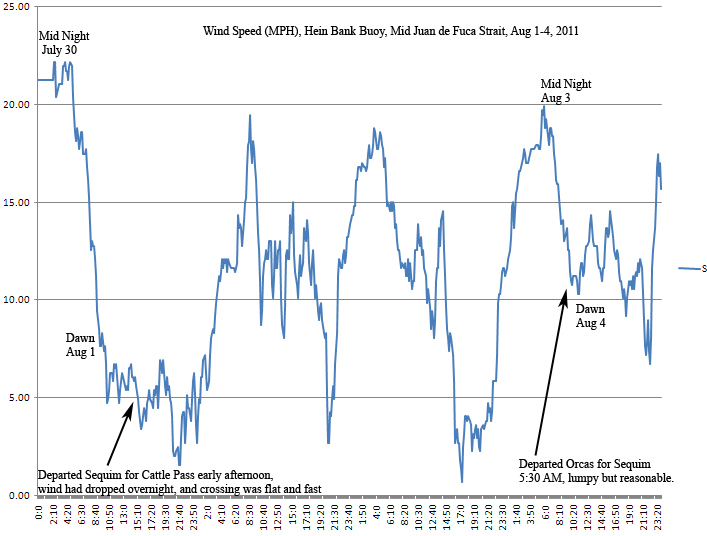 While there was a large flood tide underway, the winds had died off from 20+ Mph the night before and continued to subside in the late morning to hover in the 5-7 Mph range during my crossing from 1-3PM. The return from Orcas on Aug 4 was a bit bumpier, especially as I approached Hein Bank. However it was not bad, and the overall trip took me just 15 minutes longer that the trip over. 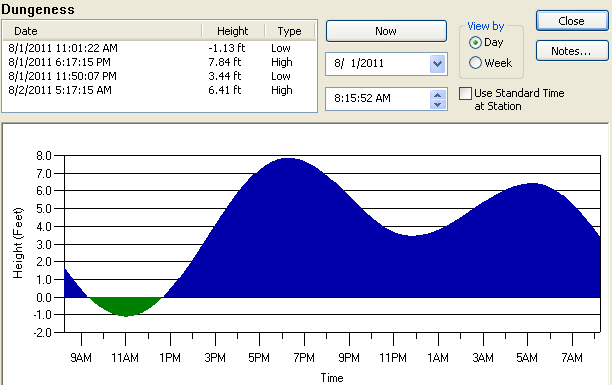 The wind had dropped the night before from 20 Mph to roughly 10 Mph, and the tides were modest flood. I think the early morning departure helped, and getting across the strait before the winds got over 15 Mph also helped. Once again we were facing a significant flood time, but this time the winds in the middle of the strait held steady overnight above 15 Mph and actually built during the morning and early afternoon hours to close to 20 Mph. As we headed west from Freshwater Bay to Crescent Bay, the seas went from a light chop to full-on 3-5 foot pyramid shaped waves, coming from no discernable direction. The winds appeared to be coming more from the north than straight west. We slowed the boat from 20 Mph to about 14 Mph (over ground), and conditions were uncomfortable. Our speed was surprisingly high for the motor’s RPM’s and the seas. It felt as thought we were going with the current. This persisted for approximately 10 miles, and then the seas went completely flat, at around 10 AM for the next 10 miles. My guess is the current was swirling in the strait, and actually going out strongly, creating large areas of opposing current and strong winds. I understand these are referred to as “overfall” conditions. Continuing west, as we approached Pillar Point, in the 11:30AM time frame, we saw a repeat of the prior rough stretch, and things went quite nasty. We headed to an area about 4 miles offshore from Seiku, where many boats were fishing. Here the conditions were typical of a strong westerly with a flood tide, bigger swells, more predictable seas, white caps, etc. These conditions were not pleasant, but are easier to deal with than confused seas. 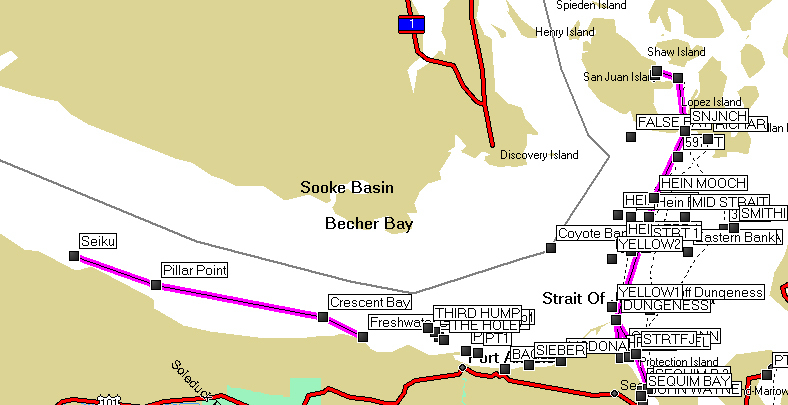 One “bad trip” in approximately 2002, was intended to route us from Sequim to the San Juan Islands. This was before I was aware of the real time buoy data, and/or before it was available. As we were unable to leave in the early AM, and the afternoon westerly’s were in full force, we ran downwind in the late afternoon from Sequim to Port Townsend and overnighted there, planning a daybreak departure in what we hoped would be calm conditions. 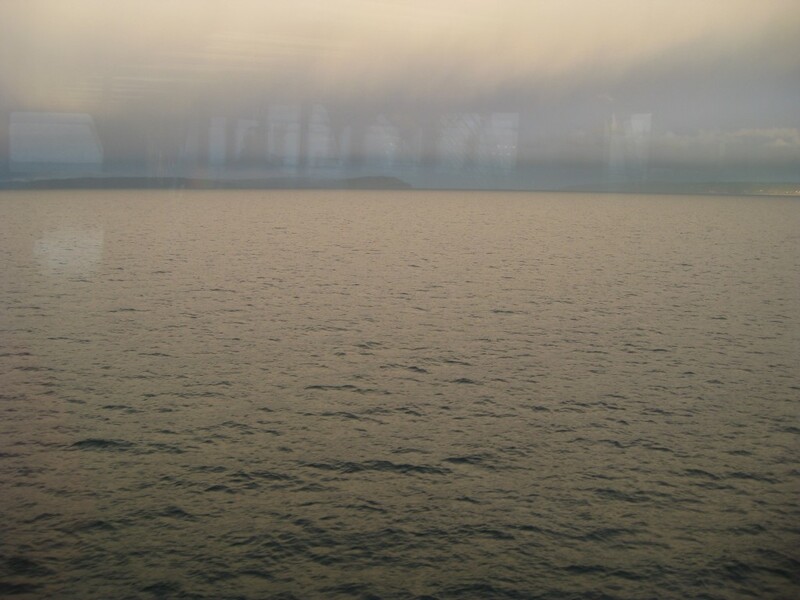 Well, it blew all night, and as we headed from Port Townsend toward the Northwest, conditions deteriorated, with steep seas increasing as we got 3-5 miles NW of Point Wilson. We turned around on this trip after following a 40 + foot commercial fishing vessel and watching it getting thrown all around. Another trip we were returning from Roche Harbor to Sequim via the west coast of San Juan Island. As it was calm at Roach and things had been quiet for several days, we left around 10 AM. The westerly’s had kicked into to full gear, and were running straight up Haro strait. My mental note here, was don’t expect shelter from the westerly’s due to Vancouver Island in Haro strait, they may just curve and head north. This was a very long schlogg directly into the seas until mid Strait, where we turned and tacked SE, into Sequim. On two other trips over and back to the San Juans from Sequim, we had a rough time over Hein bank, with large (>2 mile) stretches of confused steep seas. These were in mid-morning, sometimes with fog, and increasing winds, likely in the 15-20 mph. In all our many trips out of Neah Bay, we frequently encountered large ocean swells, but invariably these came from the west, southwest, or northwest; there were areas of rip tide, but these areas were typically long and narrow, less than ½ mile in width, and easy to blast through in my boat. Sometimes the wind would pick up out of the west, but usually this was oriented with a big swell resulting in predictable following seas. What is to learn from all of this? First, beware the Eastern Strait of Juan de Fuca. While much is written about how treacherous the Western entrance is, and this is not to suggest any lack of prudence there, the Eastern Strait in the summer, with its combination of high winds, currents, significant shoal areas, large distances to land, and typically few other small craft, is an area to treat with significant caution. We have seen large areas of “overfall” conditions in the Eastern Strait. We are not talking about short stretches of defined rips, such as we’ve seen off Dungeness Spit, or in the west entrance near Duncan Rock, we are talking about miles of steep pyramid shaped seas in all directions, which require significant caution. Second, watch for days when that wind doesn’t die off. The common assumption is the winds calm down at night, and early AM crossings are the way to go. Well, our experience is sometimes, perhaps even 1/3rd of the days in high summer, the winds don’t really subside much. Avoid crossing those days where the winds in the AM are over 15 Mph, especially during periods of high tidal flux. Consult the Hein Bank Buoy data frequently!! Finally, expect some very nice, flat crossings. 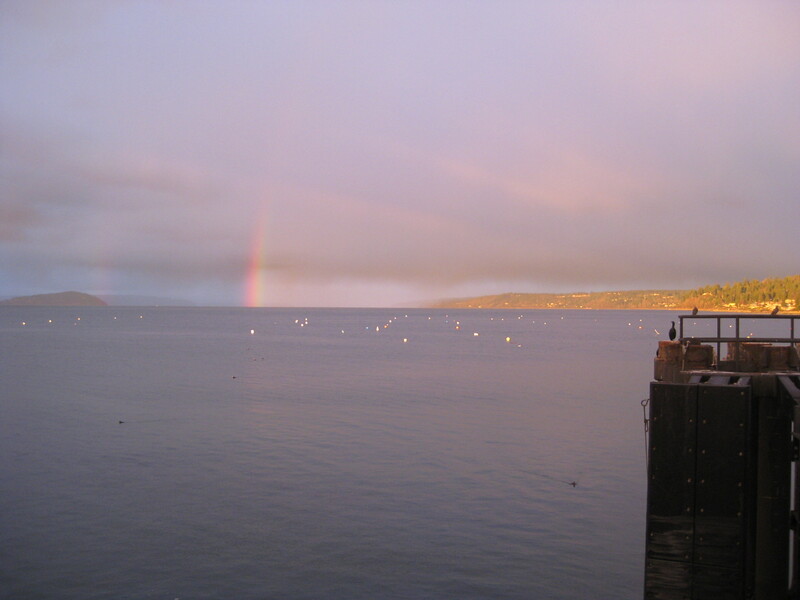 While conditions are sometimes bad, there are plenty of days where in a fast boat you could run from Port Townsend or Sequim to Friday Harbor for lunch and back with no problem. We would love to hear from anyone with significant experience crossing the strait in small craft. We’d love to hear from people who have studied the currents/tides in more depth, (no pun intended!) and understand more about the complex relationship between the tides, currents, shoals and seas. Most of our trips have been on westerly flood tides with westerly winds, but we’ve still seen major overfalls and tide rips. Regarding fog, we’ve seen plenty of it. When we are in it we slow down to 14 Mph or less, look around very carefully, and turn up Channel 16. We don’t use radar. Multiple times we have come close to other craft, large and small, but have never been even close to a collision. One time we have been hailed on Channel 16 by a freighter and told to change course. We did with no issues. Perspectives on fog and radar? 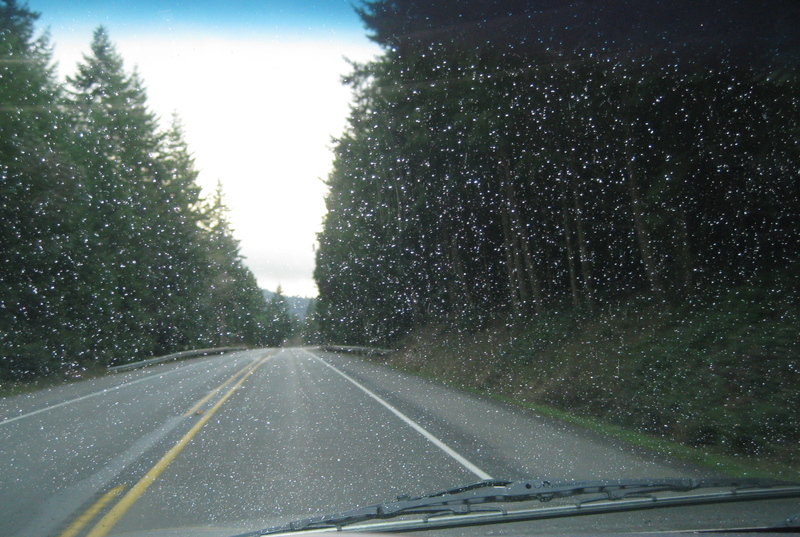 Best routes from the Sequim/Port Angeles to the San Juan Islands. Is Port Angeles =>Victoria =>Roche Harbor a less exposed route? Is Sequim=>close to Whidbey =>Rosario Strait less exposed? Background information: I am a relatively experienced boater, but nothing like a commercial pilot. I get around in a 21 foot welded aluminum boat with a primary outboard and a trolling motor on an “offshore” bracket. The boat is a heavy duty, Wooldridge “Deep Water” model, weighing 3,500 lbs with 100 gallons of fuel; it sports a fully enclosed pilothouse and deep V hull all the way to the stern. We carry two VHF radios, a marine GPS chartplotter, a 2nd GPS feeding a laptop computer, and an unsinkable lifeboat. Below a photo of our boat, swinging off a buoy after a pleasant evening in Freshwater Bay. We are in a two week period of extreme storminess right now, which as Scott Sistek of KOMO noted, includes 10 storms lined up and aiming at us, yet the weather doesn’t seem that dreary. 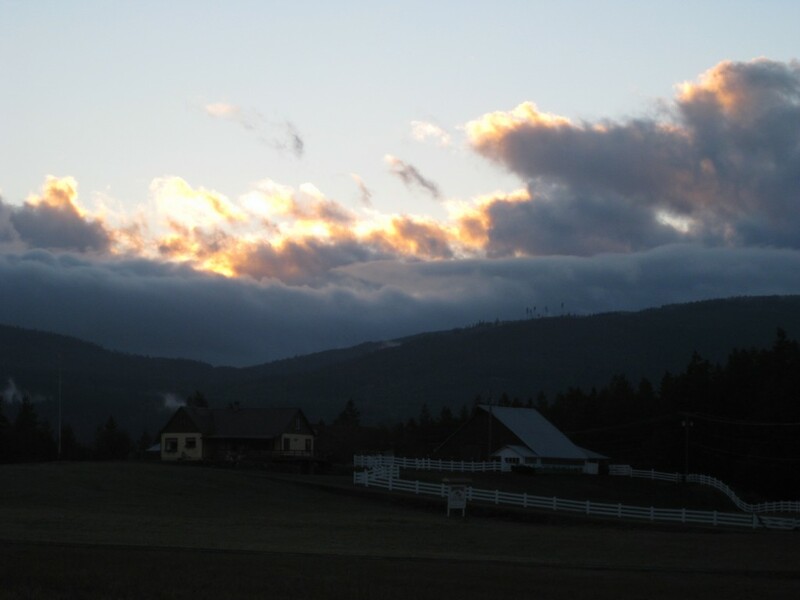 The last week has seen a lot of sunshine, likely enough to qualify as mostly sunny days in the center of the shadow in Sequim, while at the same time there have been periods of strong winds and strong showers. Hurricane ridge, now with 10-15 feet of snow pack, has probably received more snow in the last few days than the entire month of January, while it has been for the most part bright, windy, and dry down on the Dungeness plain. What is going on here? Well, we have a cool, active, zonal storm pattern combined with dramatically increasing seasonal solar radiation. The storms are rolling in fast and furious off the Pacific and blasting the high country of the Olympics and Cascades, while creating a nice big shadow at the same time, even extending over the Seattle area at times. Net result, sunshine peaks through the shadow frequently, leaving us with the perception of bright weather. This is exactly the opposite of the dreary weather we saw in January, which was characterized by weak, slow moving, warm storms, and persistent overcast. Below is the solar radiation chart from our Sequim weather station for the very stormy period that commenced on Tuesday, March 8th, 2011. Five of the seven very stormy days look like mostly sunny days in the rain shadow, with the other two have moments of bright sunshine. Cliff Mass , of the University of Washington, noted the dramatic shadow in an amazing radar image from Sunday, March 13th, and we’ve put up some photos at the bottom of this post which capture the essence of the shadow on the the evening of the 13th and during day on the 14th of March, 2011. Bottom line, as we noted on our meteorology page, spring storms are often good for sunshine in the shadow! Here is a photo from Sunday evening, March 13th, looking from Port Angeles, to the E-NE, into the forming shadow. 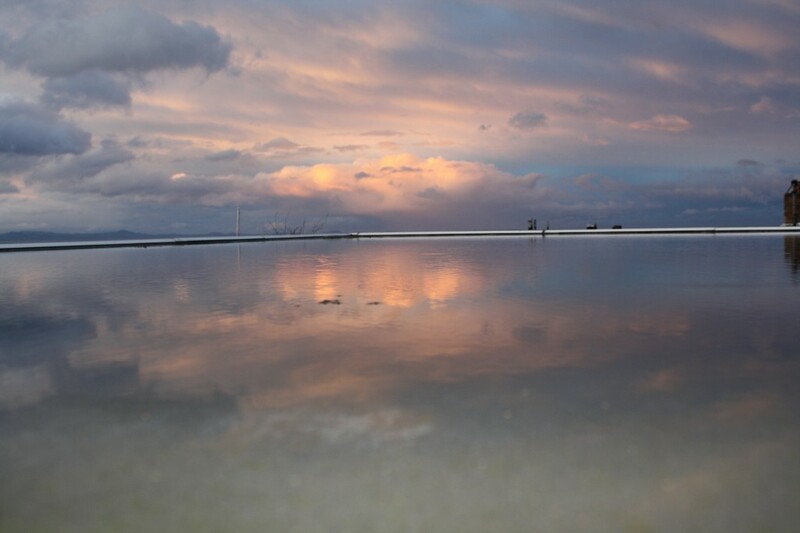 The reflection is off the flat roof of a building. 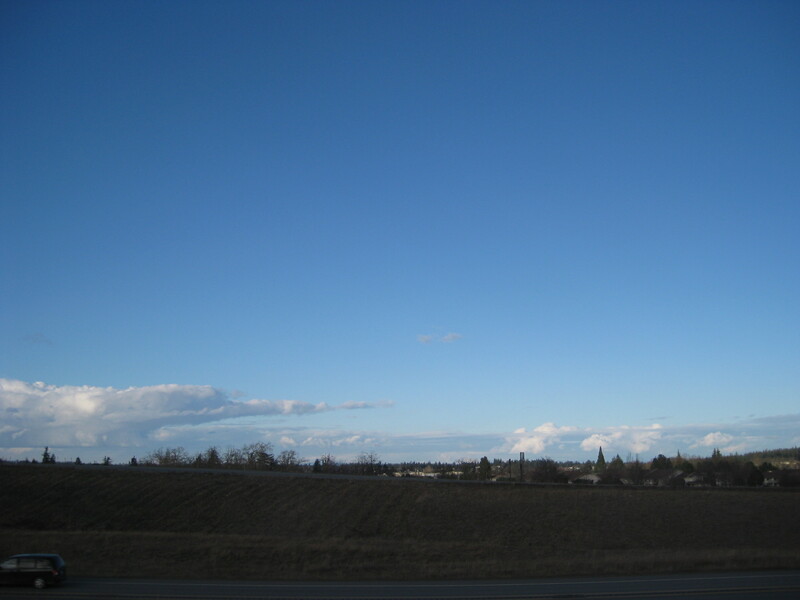 The photo below is taken looking SW from the Dungeness Plain, toward the mountains, on Monday, March 14th. The subsequent photo is taken from the same place, same time, but looking NE, toward the Strait, into the shadow. 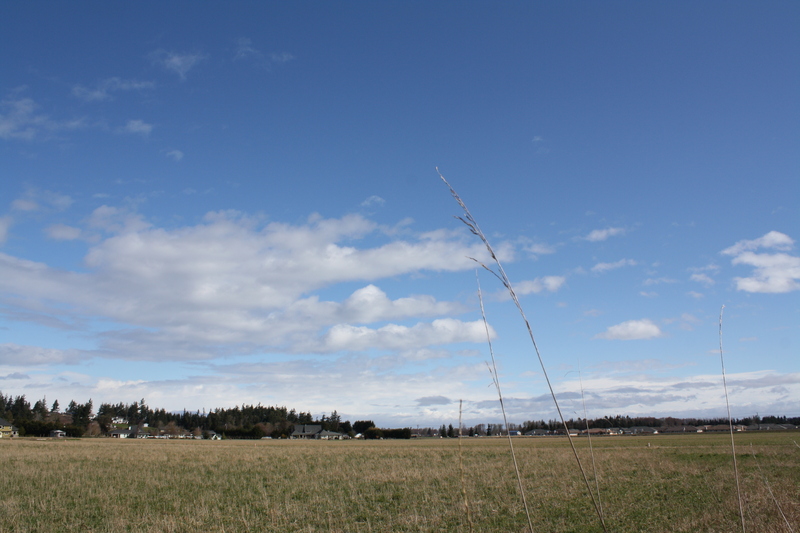 The below photo shows the clear blue skies in Sequim on Monday, March 14th, while the following one, taken roughly two hours later near Poulsbo, shows the heavy rain at that location. Of course, your mileage may vary; the shadow has a mind of its own! Now, that was a Sunny Day! Certainly you have noticed how significantly brighter things have seemed during the last several days. 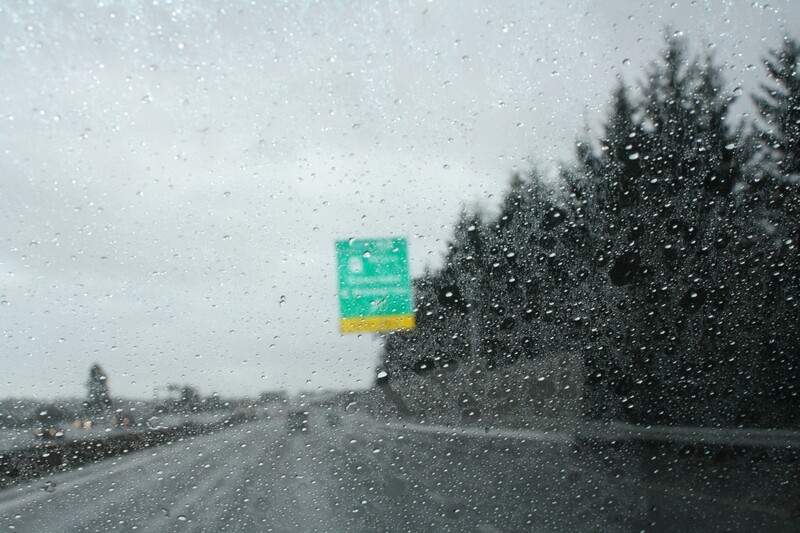 Well, as it turns out, Tuesday February 8th marked a major milestone in the rain shadow. The peak level of sunshine was the highest recorded since October 2nd!! We haven’t had a chance to compare this to Seattle yet, but on that particular day, Sequim was in a very nice post frontal period, while Seattle and the cascade foothills saw a combination of overcast and clear weather with a bit of convergence zone still in the mix. As we noted, often things come together in February in the rain shadow for some nice sunny days and a definite turn toward spring. The days are a bit longer, the sun a bit higher in the sky, and the storms seem to move through a bit quicker. This all results in lawns and daffodils growing, birds chirping, and happy people. 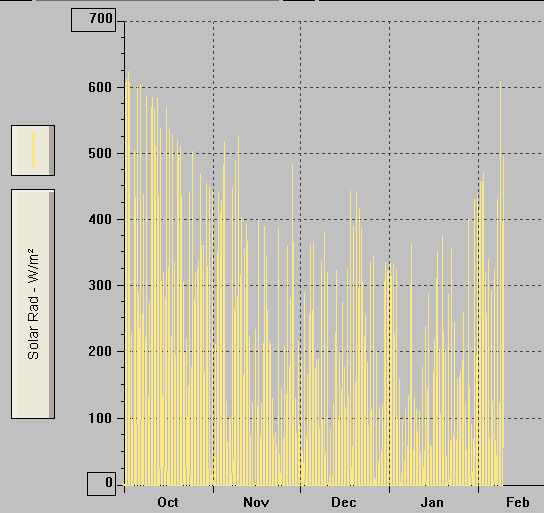 Take a look at the chart below which shows solar radiation over the last four months. You will immediately see the bright sunny day recorded on this last Tuesday, February 8th. Go sun! Go shadow! 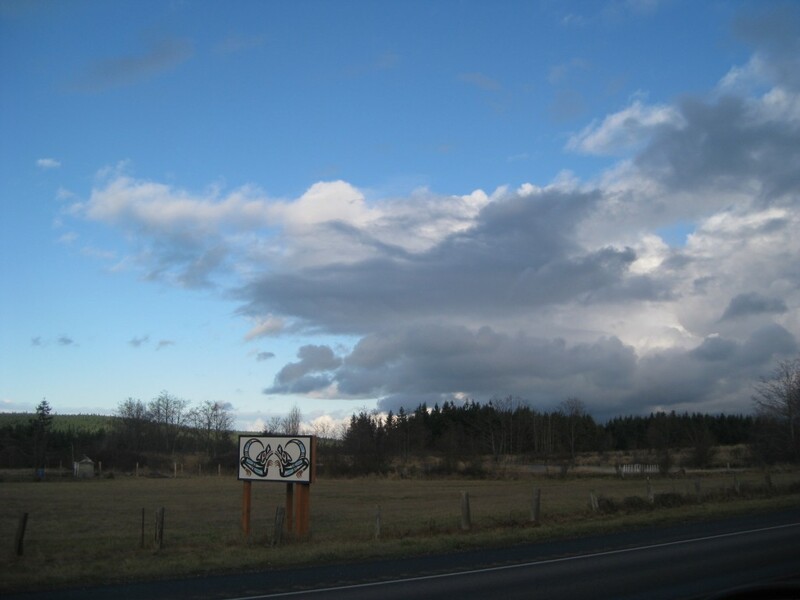 Classic cold front swept through this afternoon, Friday January 7th, creating a very nice blue hole in the Olympic Rain Shadow, which I crossed into during a well timed trip from downtown Seattle to Sequim. Saturday the 8th was post-frontal, convergence zone, type weather which, per the expected, produced a gorgeous, spring-like bright sunny day in the Shadow. Here is the play-by-play on Friday with some attached photos…. Commencing from Seattle at 2:30 pm in miserable wind driven rain, I passed into the Shadow at about 4PM in the area just east of Discovery Bay, and ended with mostly clear skies in Sequim as the sun was setting. Here is the play-by-play with some attached photos…. 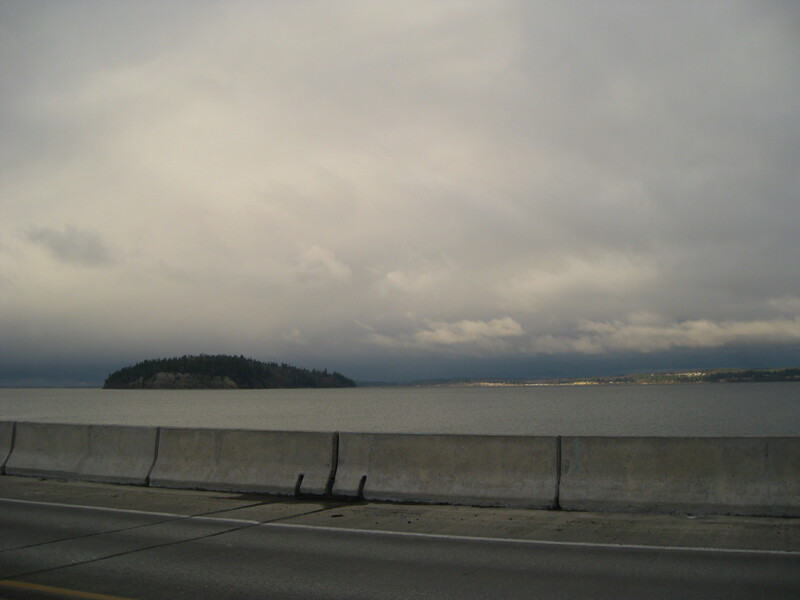 Hood Canal Bridge looking south 3:30 PM – gray and ominous! Discovery Bay 3:50 PM – Bring on the Blue Hole! 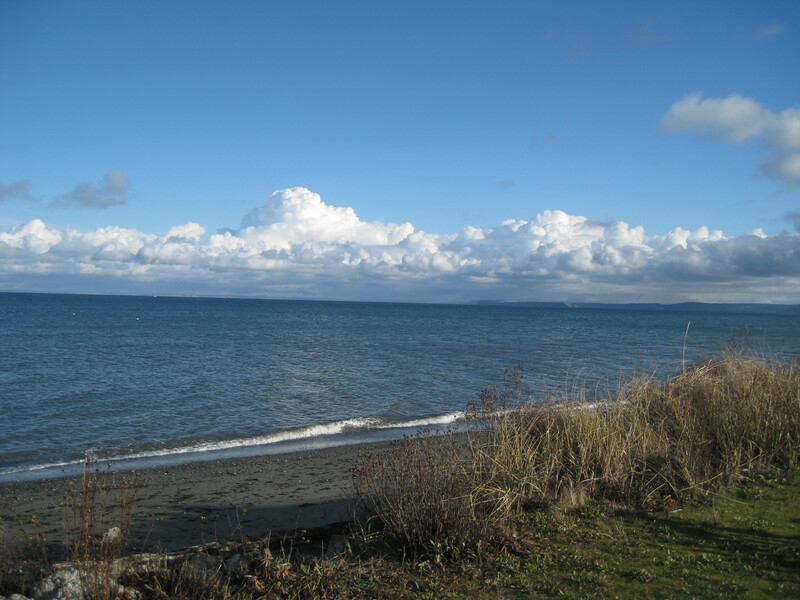 Diamond Point approaching Sequim Bay, looking south – Shadow here, dark up there! The solar radiation on the weather station today did not peak above 200 w/m^2 , likely registering a dreary day, but it was a little jagged…and that typically indicates bursts of sunshine. More from a perception point of view, even half an hour of deep blue sky and sunshine leaves a lasting impression on someone who hasn’t seen it for a while! Saturday dawned clear and sunny in the heart of the rainshadow, and the day was brilliant and blue. 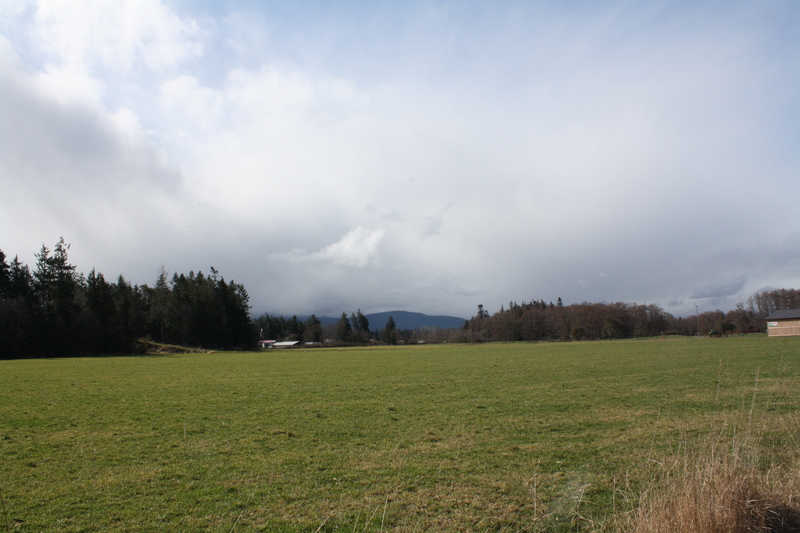 Diamond Point 3:11 PM – looking north, edge of the shadow….. Approaching Discovery Bay 3:17 PM – Bye Bye shadow, hello showers! 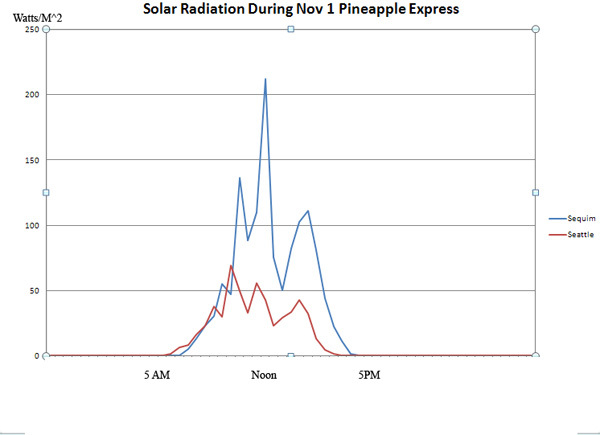 Will the Pineapple Express Consume the Olympic Rain Shadow? Pineapple Expresses affect our region several times a winter. Whether they overwhelm the benefits of the Olympic Rain Shadow is a very interesting question. I’ve seen it go either way, and my thoughts on climate when I put the site together leaned toward an answer of yes. But data from a recent storm suggests perhaps otherwise. Some background below, and a bit of analysis. Arctic Express - A great example of this was the recent mini-blizzard that hit Monday before Thanksgiving, 2010. Storm track from the NW, Cold Frazier River outflow, reverse rain shadow, snow in the Shadow, a lot of snow! Zonal - What we back country skiers love; storms with defined cold fonts arriving from the west; sometimes stacked up, looking like “commas” on the satellite imagery. Pineapple Express – “plume of moisture” originating from near the Hawaiian islands. Well just today there is a very well advertised Pineapple Express bearing down on our areas Sunday. 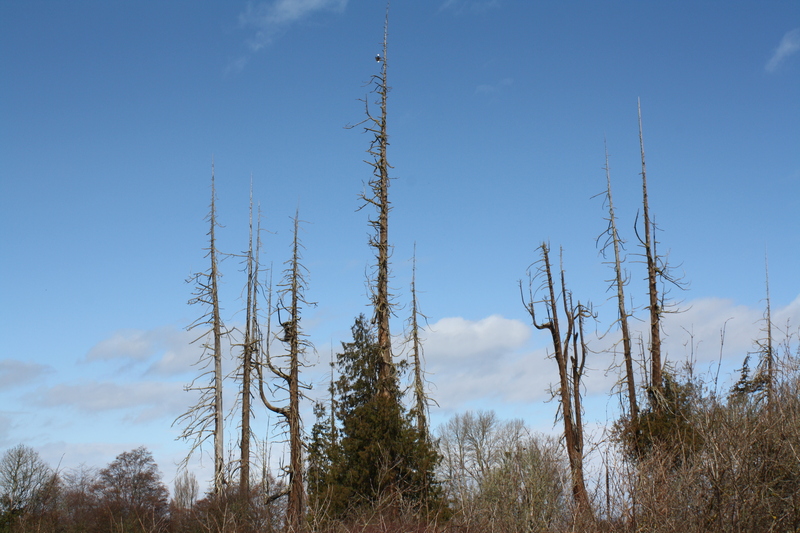 See Scott Sistek blog post from Komo, or Cliff Mass’ post today. Will Pineapple consume the Shadow, resulting in gloomy, wet, depressing weather everywhere? You’d think it might, but my data suggests the Shadow might prevail! For some perspective, I looked back at the last such storm, which hit from 4 am to 4 am on November 1st, reducing our gorgeous snow pack at Hurricane ridge from 20+ inches to near zero. Cliff Mass blogged extensively about this storm. I worried about it! Luckily it move through a bit quicker than originally anticipated and we didn’t get major flooding. During the Nov 1 Pineapple Express, my Sequim weather station near the center of the shadow recorded only .26 inches of rain to Seattle’s 1.16; we recorded 2.34 times the solar radiation, with 4 hours of dark skies, 2.5 of gray skies, 2.5 of bright skies, and zero hours of clear skies, qualifying for what I would would call a bright overcast day. 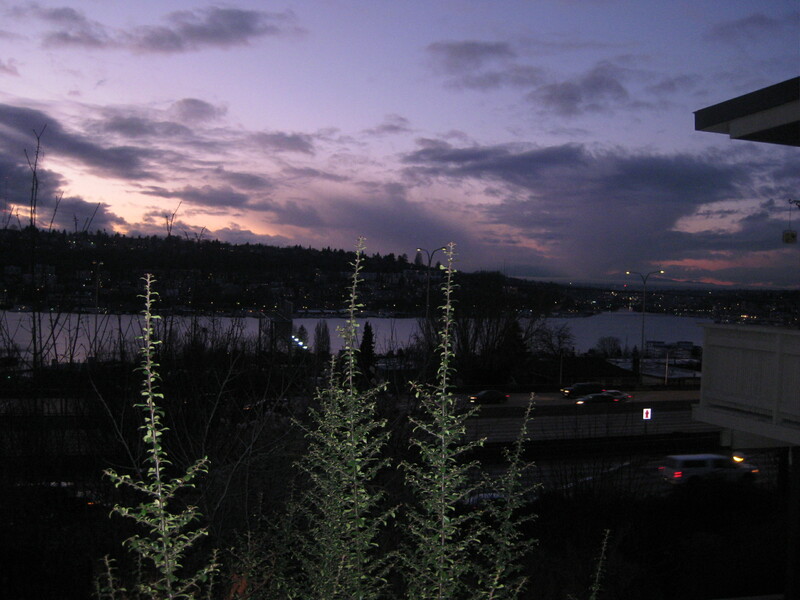 During the same period, Seattle’s UW station recorded 7.5 hours of dark skies, and only 1 hour of gray skies, resulting in a clearly dreary day. Here is the radiation graph that day. Well, it wasn’t a great day in the Rain Shadow, but it clearly was a whole lot brighter that Seattle. I remember the day well in Seattle, having walked to work, through pouring rain. Hedge, (what weather people do! ), the Nov 1 Express came through quickly; if the Dec 12th express stalls, (it isn’t supposed to), it might still consume the shadow. Collateral benefit, it might stabilize the snow pack from future avalanches later in this season. While it was significantly drier than surrounding areas, it still rained .86 inches at the weather station in Sequim, pretty consistently from mid-afternoon Saturday through Sunday PM. 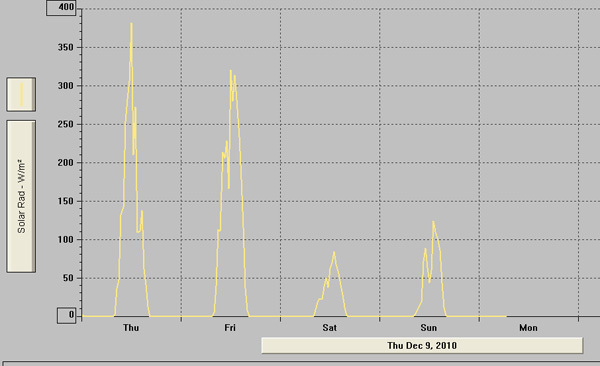 The big wet storm from the south obscured the sky, (max solar barely breaking 100 w/m^2), and resulted in a couple of dreary days in the shadow. Now some might argue that the shadow had a profound effect, with 12″ + precip totals over in Quinault, but from our perspective, if it “looks like a duck, it walks like a duck, it quacks like a duck, then it IS is duck”. Rain + Dark = Dreary. Strong Pineapple Expresses consume the Shadow, per our suspicion. Also, take a look what all that precip did to the Dungeness River… in the new photo uploaded to our gallery. I found this exchange about how unique the Olympic Rain Shadow is to be intriguing; we welcome any comments about other rain shadows around the world. I came across your site thanks to an article in today’s Peninsula Daily News (front page no less). Will be checking it regularly for weather info and discussions. My wife and I relocated in “the rain shadow” about eight years ago after retiring. 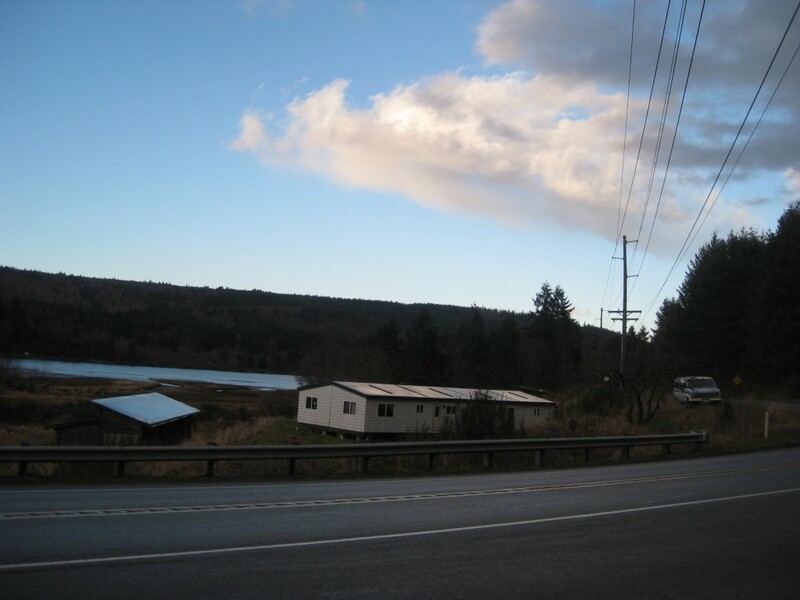 The Port Angeles/Sequim area seemed like a desirable place to live and we have not been disappointed. One thing that has intrigued me since moving here, though, has been the focus on the rain shadow as if it were something unique. It seems to me that it much resembles the climate differences seen between the eastern slopes and the western slopes of the Cascades, the Rockies and most mountain ranges in the northern hemisphere where the prevailing winds are west to east. As the windward air climbs the mountains it becomes less dense and adiabatic cooling occurs at a fairly fixed rate. Eventually the air cools to the dew point and condensation occurs. Condensation heats the air thus slowing the cooling so that once over the top, the air is actually warmer than it would be otherwise. On the way down the other side, adiabatic heating is the rule plus maybe a little heat from condensation in the higher places. The result is that the leeward side valley basks in net warmer air than the windward side. Warmer air holds more moisture and results in fewer clouds, thus the “blue hole.” That warmer air is then cooled by the Sound so that it can rain on Seattle’s parade where it is supposed to. I like your analysis of the adiabatic effect. there is alot going on there from a thermodynamics perspective. You’re so right, there are alot of rainshadows…, east of cascades, east of sierras, central Spain vs NW Spain and France, they are all over the place. 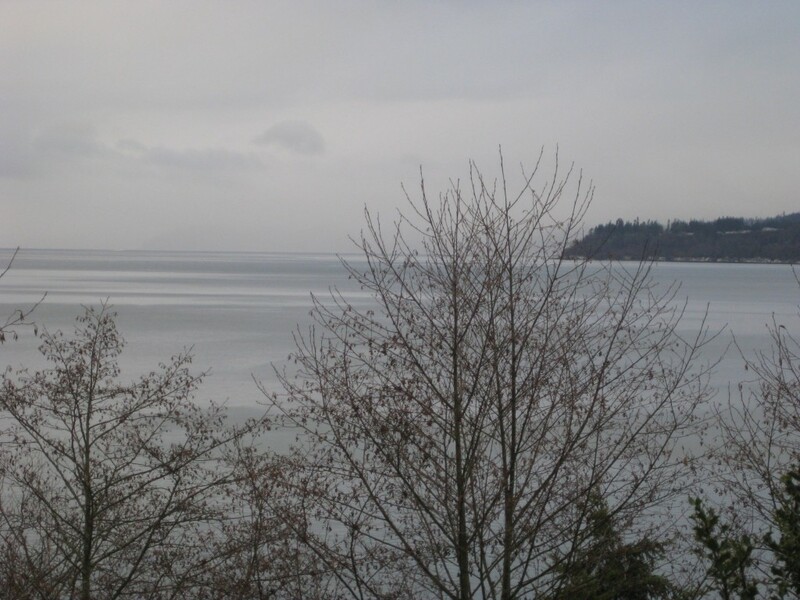 But since the Olympics are a bit unique (clump of mtns rather than range), and situated as they are with the Puget Sound leeward, the rainshadow in the Olympics falls over an awful lot of water and waterfront. Haven’t found too many like that. Of course there is the sunshine coast in East Vancouver Island. Need to research that!